How to show images from database into Picture box? In this article I am going to explain about how to show images from database to picture box. 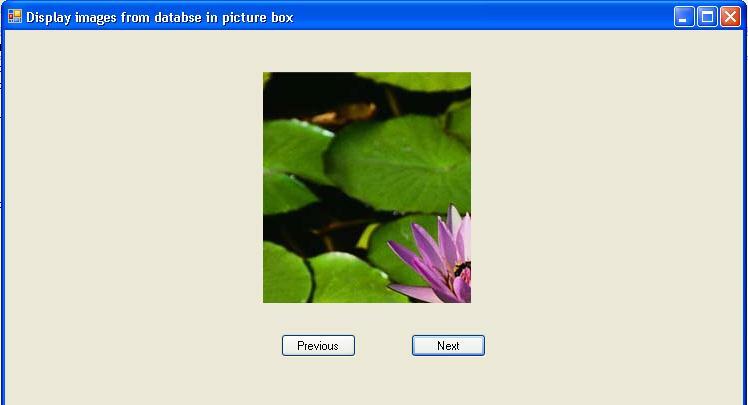 Here I have stored images in the bytes format in the database convert that image and show in picture box. In my previous article I was explained how to show all images from folder to picture box control. Here I have explained in detail about how to show stored images (as a bytes) from database to picture box as slide show. I have convert that pictures bytes to picture and stored in the folder user view all images in the picture box using that folder images. Providing Previous and Next options to see previous and Next images in the same folder. Using InsertImageToTable() method to insert images in to that table for testing. I hope this code snippet is help you to know about Display image from database in picture box. Thanks a lot for sharing this with us this is really a good stuff.